Why is it worthwhile to sing in the Li-Ron Choir? The Li-Ron Children and Youth Choirs strive for and embrace musical excellence. The Choir is a center for vocal artistry and contributes to the participant’s development and growth. Involvement in the Choir also advances social growth by the formation of ties across age and gender. The members all share a common goal. The success that’s achieved by learning to cooperate with others provides skills that are useful in all aspects of life. Participation in the Choir assists in developing self-awareness; discovery of one’s abilities and the realization of one’s potential. Singing in the Choir enriches the participant’s world and helps develop better understanding of one’s self and others. 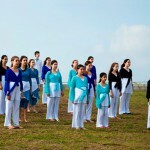 The uniqueness of the Li-Ron Choir is its welcoming of children and youth who do not come from musical backgrounds. With hard work these same children and youth often reach amazing levels of musical excellence. Participation in the Li-Ron Choir often leads to experiences of great joy and creativity. This is a result of learning listening skills, discipline and persistence. The participant invests everything he has in the process.